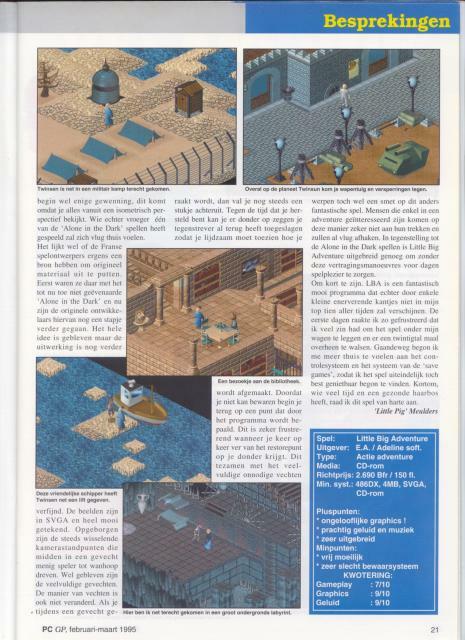 A review of LBA1 in a Dutch game magazine PC GamePlay (former name: PC GamePro), issue 1995 februari\March. Part 2. But hose who have played one of the ‘Alone in the Dark’ games in the past will feel at home very quickly. It seems like the French game designers have a source somewhere to get original material from. First they were there with the until now never beaten ‘Alone in the Dark’ and now the original developers of this have taken another step forward. The whole idea has stayed the same but the details are even better. The images are in SVGA and are very nicely drawn. They have put away the changing camera view points which drove a lot of players mad during a fight. They have kept the amount of fights. The way you fight hasn’t changed either. When you get hit during a fight you will still fall back a little. By the time you have come back to normal you can be sure your opponent has already striked again so you will just have to watch while you are getting beaten up. Because you can’t save you will start again at a spot the program chooses. This is really frustrating if you get beaten time after time far from the restore point. This together with the big amount of fighting are down points to this fantastic game. People who are only interested in an adventure will definitely not get what they want and will stop playing very quickly. Compared to the Alone in the Dark games, Little Big Adventure is big enough to get days of fun without any delay. In other words, LBA is a really beautiful program which will not get into my top ten games of all time because of some frustrating edges. The first days I got so frustrated I wanted to put the game under my car and drive over it for some time. After a while I started to feel more at home with the control system and the save system so I started to enjoy the game in the end. In other words, I really recommend the game to those who have a lot of time on their hands and have some healthy hair .